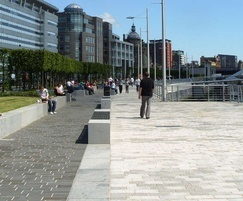 Hardscape supplied paving for parts of Broomielaw, a major thoroughfare on the North bank of the River Clyde. The aim of the project was to improve the appearance of the area, making paths and roads more effective. 13,800 square metres of linear parks were created using granite and Italian porphyry paving, which is resistant to wear and able to resist physical stresses. Previously run down areas on both banks of the River Clyde were regenerated, allowing access by foot and bicycle.